This beautiful Gold tungsten ring in 4mm 6mm 8mm wide are available. 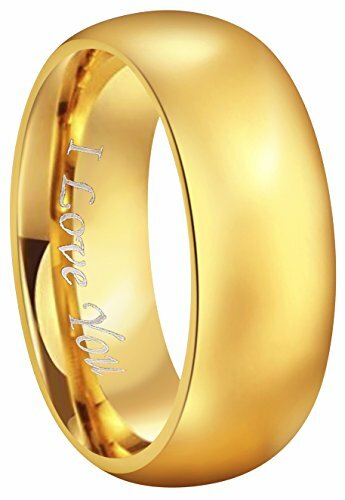 It is dome high polished 24k gold plated tungsten ring.Inside of the ring engraved "I Love You".It's great for Wedding bands,Engagement Ring,Gift Ring,Couple rings. If you are looking for a ring that is scratch proof and forever keep its shine, than our Tungsten Carbide rings are for you. Tungsten Carbide is ranked second hardest next to diamond on the Mohs scale, diamond being a 10 followed by Tungsten Carbide as 9. All of our Tungsten rings are Cobalt Free and hypoallergenic. Our rings will not cause skin irritations or turn your fingers green. Due to the Hardness of Tungsten, these rings can be laser engraved, but not hand engraved. 24K Gold Plated Tungsten Carbide (Cobalt Free).4mm 6mm 8mm Widths are available. Engraved:"I Love You",it's great for Wedding ring,Engagement Ring,Couple Rings,Gift Ring. To ensure you receive the authentic CROWNAL item, please only buy from sellerCrownal (Authorized). Crownal is not responsible for Replica or other inferior quality product.